I read this article and found it very interesting, thought it might be something for you. 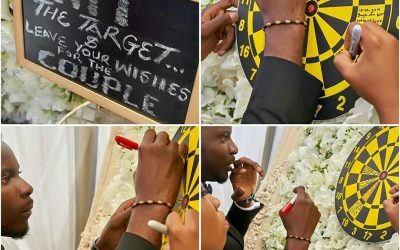 The article is called #IdeaYouCanTry: Dart Board and is located at http://www.ipcevents.com.ng/ideayoucantry-dart-board/. Our guest book was an Instant Hit! Not many people thought we could actually use a Dart Board as a guest book, other than what the game is for…..Well, we did and its so beautiful! With the Dart Board, you can sign in front and behind, and after which, the couple can place it on their wall in their new home.